Abby the Librarian: Save the Date: 48-Hour Book Challenge!!! It's time to start gathering your To Be Read pile up and stocking up on snacks! 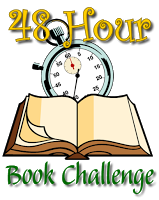 Pam at MotherReader has just announced the TENTH ANNUAL 48-Hour Book Challenge will be held on the weekend of June 19-21!! This is one of my favorite weekends of the year and you can bet I will be reading with bells on (um, is that a thing?). More details to come at MotherReader.com, so stay tuned.